Now that is cherry picking at its best. Congratulations! Nice job! Crossing that line from AU to MS is a pretty significant step. I have taken great advantage of these "Ask the Expert" sessions at every ANA Worlds Fair of Money for the past four years. As one example, I had purchased a raw 1908-S U.S./Philippines 50 Centavos on eBay in 2010. It was toned & dirty, but I bid high on it because I thought it had potential. I sent it to NCS for conservation and then on to NGC where it returned with a grade of AU58. I always felt like it looked better than that, and everyone I showed it to thought it deserved to be in an MS holder too. In 2015, Mark Salzberg examined my AU58 and also upgraded it to MS61. With only seven examples graded above MS60 by NGC, I felt pretty good about that! This isn't the only upgrade I've received, but it is one of my favorites. What amazed me most about Mark was that he not only remembered me the second time we met, he also remembered the coins I had shown him a year earlier! I'm heading for Philadelphia in a few weeks and I'm very much looking forward to meeting with him again for another consultation on a few my coins with potential. Anyone attending the ANA this year should consider taking advantage of the this exceptional opportunity to "Ask the Expert." Sadly don't expect the same courteousness, time and insight at PCGS, if D.H. is the expert. Just my experience. Like coin928 I was amazed at how down to earth, smart, caring and kind Mark Salzberg was. He is a true gentleman and scholar. My comment about the other grader comes from these two experiences 1) my first encounter with mark over crossing a 1872 business strike from PCGS to NGC, he had a cold and was clearly not feeling his best and as I waited in line one of NGC people asked if he wanted to stop as the Hour of " meet the expert" had ended but he said no not until everyone who was in line prior to the top of the hour had had their turn...WOW! And 2) at the PCGS table I took a PCGS 1877 Indian cent that had a bit of verdigris at the date to ask about spot removal or conservation. This was 30 minutes into the "hour" and D.H. was in a discussion with John Dannreuther (who himself is a super smart and nice man.) D.H. basically just blew me off, sending me to talk with one of his staff who informed me that only D.H. was authorized to make the call. So I get back in line and a few minutes later D.H. left with maybe 7 or 8 people in line with me and 15 minutes left in the hour. Maybe it was just a bad day for D.H. or maybe an urgent matter came up, I don't know, but the behavior of Mr. Salzberg sets him and NGC above the other "service" in my mind. I am not trying to badmouth anyone, but it is clear Mark Salzberg is not in it (numismatics) just for the money. Sadly don't expect the same courteousness, time and insight at PCGS, if D.H. is the expert. My experience as well. I waited in line to show him a PCGS graded U.S./Philippine coin. When I sat down to discuss it, he simply looked disgusted and said he didn't know anything about them. That was it, no referral to another PCGS employee, nothing, just summary dismissal. "Next!" For the reasons specified in this thread and more I prefer NGC. For example, although the following experience does not exactly line up with the subject matter of this journal thread, I believe it is evidence of a pompous attitude on the part of PCGS. Yesterday I followed a webpage link to an absolutely stunning MS-64 PCGS 1857-S double eagle offered by APMEX. Interestingly, the coin did not have the SS Central America pedigree and on the surface seemed like a good deal. It was here that I did a little extended research on the coin. First I verified the certification and found the coin had appeared in a recent Heritage auction. The coin that I thought was a decent deal proved to be not as decent as I would have liked since the coin had a 25% mark-up. Next I followed the PCGS coin facts link to an extensive write-up on the 1857-S double eagle. 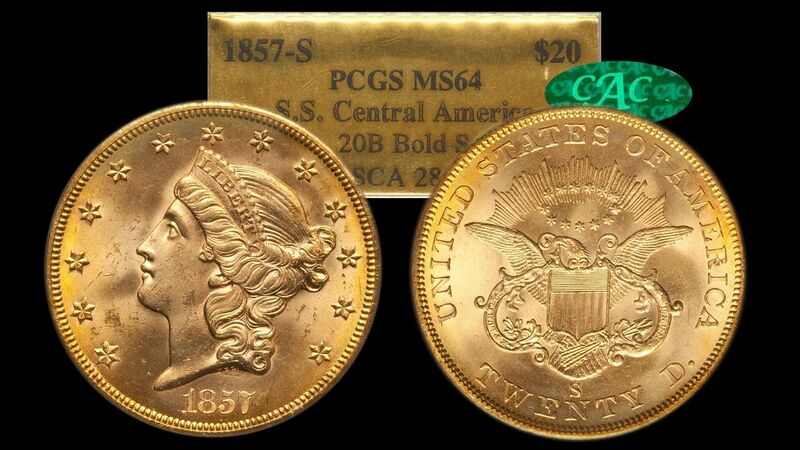 As I read through the write-up I came to a paragraph recommending that you not crack out the Central America pedigreed coin out of the PCGS gold foil holder. Not bad advice, since I believe the pedigree in an original holder commands a market premium. Next they recommended that you not purchase a Central America coin crossed into an NGC holder. Again, not bad financial advice. The next phrase is a deliberate jab at NGC that was not needed to convey the previous two points. The phrase goes on to say, " Stay clear of NGC graded S.S. Central America double eagles. They may be nice coins, but they have been cracked from their original holders and probably upgraded". I know that both grading services have come under scrutiny for over-grading, but this deliberate and unnecessary jab to say that SS Central America double eagles in NGC holders are "probably" upgraded is in my estimation snobbery. I get more and more annoyed all the time when I see posts regarding how NGC is terrible, they slab fakes, people should cross NGC to PCGS.....and the list goes on. So many people act like PCGS literally is so much better and makes no mistakes.......its funny when you point out something like a details coins that gets straight graded by PCGS, now PCGS fans become quiet. If that same coin was in a NGC holder.........there is a massive bashing show.....disgusting. Was D.H. in the obligatory ugly Hawaiian shirt? A blue one I think... what a guy! JTO, your experience with D.H I thought was a one time occurence but on Instagram, I heard from other collectors that mentioned how rude and what a jerk he is towards them.